Breakthrough Basketball is coming to Winnipeg. May 17-19, 2019 Breakthrough Basketball is hosting an all-around skill development camp for boys and girls from 7th grade to 12th grade. 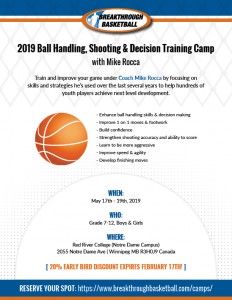 This is a unique camp that utilizes decision training drills to help players improve their ball handling, shooting, decision making, and all around offensive skills. The camp is challenging yet fun for all skill levels. This camp will take place at Red River College. 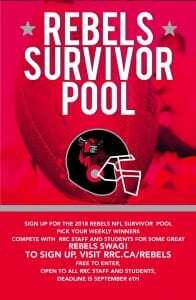 Join the Rebels Rec Services NFL Survivor Pool. Its free to enter and you can win great prizes. Each week you will pick a different NFL team to win its game. If they win you move on if they lose you are out. The deadline to enter is September 6. Create an account unless you already have one! Here is an interesting video I came across which speaks to me as I believe movement is medicine and should be taken daily. I think about movement as a pill and ask myself if I took it today or not. 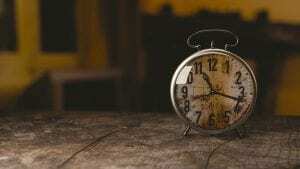 I often get caught up in the time it takes to move and why I can’t just swallow it and be done with it. 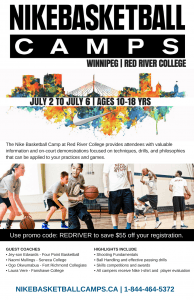 Rebels Basketball is pleased to be hosting the Nike Basketball Camp at Red River College July 2 to 6. Provides attendees with valuable information and on-court demonstrations focused on techniques, drills, and philosophies that can be applied to your practices and games. This Nike Basketball day camp is for boys and girls ages 10-18 who love basketball and want to get better. 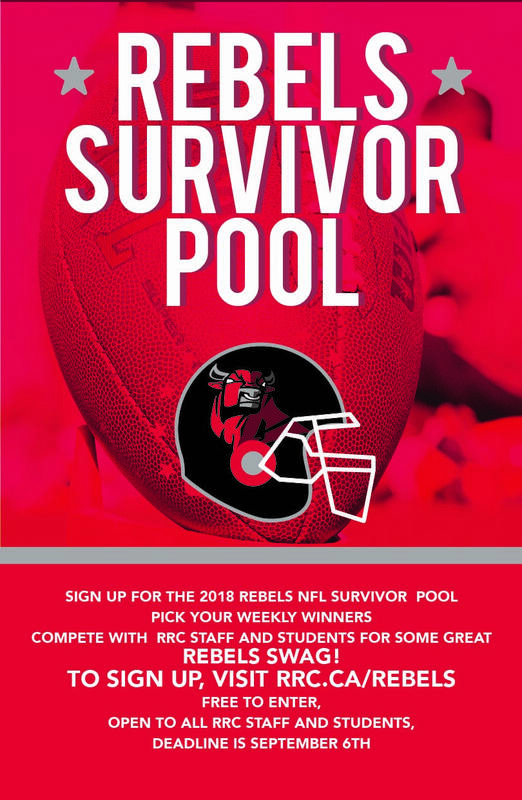 Red River College would like to invite you to participate in the first annual RRC Rebels Challenge volleyball tournament for Junior Varsity Boys and Girls teams. Format: Round-robin (2- 25 point sets) with play-offs. Each team is guaranteed a minimum of 3 matches plus a play off game. Please contact Scott Kirkpatrick by email or phone to confirm your attendance in the event. We will be filling the tournament on a first-come, first-serve basis so please reply at your earliest convenience. Spring is here, the days are getting longer and who doesn’t want to be outside to enjoy the fresh air after being stuck inside all winter. There are many outdoor options in the city, from various parks, to green spaces, playgrounds and sport fields. One hidden gem at the Assiniboine Park is the Terry Fox Fitness Trail. Registration Now Open for Spring Fitness Classes! Here it is the magic buzz word of today’s diet fads of what to eat and not to eat. But is it really a fad? Maybe people have heard of gluten free diets and many people are opting to not have gluten in their diet but why? How do I know if I even have gluten intolerance? There’s not a simple answer as it can be a hidden thing in our lives.